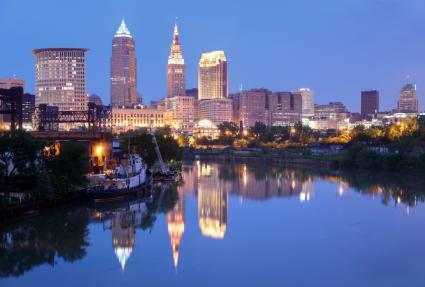 Cleveland, Ohio, is a sparkling jewel set against the ever-changing seascape of Lake Erie. Whether you take in the downtown skyline from a boat tour, or view the many wonders featured in the Rock and Roll Hall of Fame, Cleveland will intrigue, delight, and endear itself to you. The Rock and Roll Hall of Fame is one of Cleveland's most popular attractions. Called the "Rock Hall" by residents, the angular white and glass structure sits at the edge of Lake Erie in downtown Cleveland. Permanent exhibits include one of Diana Ross' sequined gowns, hand-written lyrics by Janis Joplin, and Jr. Walker's saxophone, as well as some artists' personal items, such as John Lennon's report card and Jim Morrison's scout uniform. After a rocking tour of the Rock Hall, a great place to take it down a notch is the Great Lakes Science Center. Not only is the Center filled with over 400 exhibits, it also includes the NASA Glen Visitor Center with the giant Skylab 3 Apollo Command Module, and the OmniMax Theater with a six-story high movie screen. Along with the Rock Hall and the Science museum, the city also features the Cleveland Museum of Art. This diverse museum, one of the last museums with free admission in the U.S., features a large French Impressionist collection, as well as a colorful armor court, Asian and Indian art exhibit, and 19th century sculpture by artists such as Degas and Rodin. Sports fans will love visiting Cleveland with its pro football, baseball, and basketball teams. Get tickets to see the Cleveland Browns, the Cleveland Indians, or the Cleveland Cavaliers up close and personal. Even though ESPN has crowned the city the "Most Tortured Sports City in America," the teams are still a lot of fun to watch. Cleveland's largest excursion ship, the Goodtime III, offers visitors and locals alike a view of the spectacular downtown skyline. The cruises feature entertainment, such as sightseeing, meals, cocktails, and dancing. The company also offers both public cruises and private charters, and it sails rain or shine. University Circle is Cleveland's cultural hub. In addition to the Cleveland Art Museum, this area is home to Case Western Reserve University, the Cleveland Museum of Natural History and its fun and educational dinosaur exhibit. It also boasts indoor and outdoor exhibits at the Cleveland Botanical Gardens, the Crawford Automobile and Aviation Museum, and the Western Reserve Historical Society Museum, which features diverse exhibits on life in Cleveland from the city's founding to the present. Slyman's Restaurant: Home to the nation's best corned beef sandwich, it's been visited by President George W. Bush, Rachael Ray, and Jason Castro. Mallorca: Get a taste of Spain and Portugal at Mallorca. The award-winning restaurant boasts the freshest seafood available. Renaissance Cleveland Hotel: Located right on Public Square and connected to the boutiques, restaurants, and cinema of Tower City Center, the hotel is within walking distance of the Rock Hall. Hyatt Regency at the Arcade Cleveland: It's centrally located near the Entertainment District and just blocks away from Cleveland's sports arenas. Additionally, the hotel offers a Rock and Roll Hall of Fame travel package. The Ritz-Carlton, Cleveland: The downtown area's only four-star rated hotel, it offers indoor access to the Tower City Center and is within walking distance to the Rock Hall. 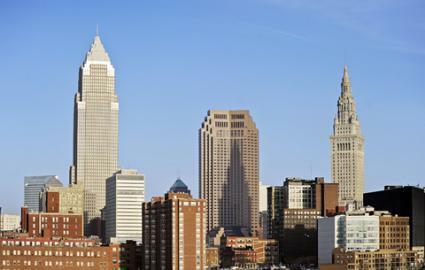 It offers panoramic views of Cuyahoga River and Lake Erie. Wyndham Cleveland at PlayhouseSquare: Located in the theater district, the hotel recently went through a multimillion-dollar renovation. The hotel now provides such extras as MP3 jacks in the fitness center. A trip to Cleveland, Ohio, may start with a tour of the Rock Hall, but C-Town has much more to offer. The diverse area has culture oozing from every street corner. There is so much to explore, you might just find yourself extending your stay or booking your next trip before you leave.